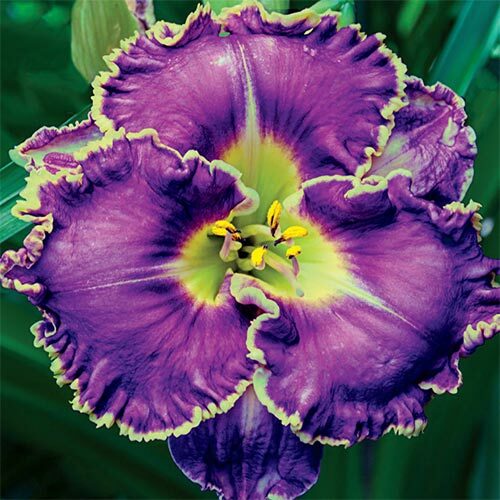 This award-winning rebloomer has it all— vibrant color, ruffles and fragrance. The 5½" lavender flowers are trimmed with golden edging. Masses of flowers bloom in midsummer and rebloom in late summer to fall. Lush, semievergreen foliage complement the showy blooms. Add a perennial home improvement—plant daylilies! Vigorous, carefree and colorful, these daylilies have been developed for their vibrant, long-lasting color. We have indicated which varieties are evergreen, semi-evergreen and dormant. An evergreen variety's foliage will remain and the plant will not go into a dormant stage, which makes it more susceptible to damage from frost. A light mulch on top of the foliage will protect the plants from this damage. Semi-evergreen varieties will lose some of their foliage and will go into a dormant stage, and usually do not require any mulching. The hardiest daylilies are those varieties that go completely dormant during the winter. Soak roots in water before planting. Dig a hole deep enough to accommodate the roots without bending them. Roots should be just below the soil surface with the crown at the soil level. Water well after planting. Cut back spent flower stems after flowering. Mulch in more nothern areas.